* International Voice of Musical Theatre winner Mared Williams celebrates her victory. There was more colourful Eisteddfod action on and off the field, some of which was captured by llanblogger. A Welsh performer has been named Llangollen International Musical Eisteddfod’s International Voice of Musical Theatre for 2018. 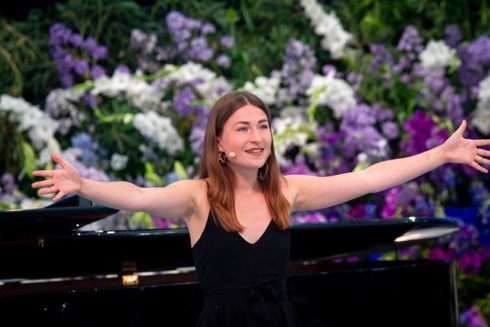 Mared Williams, aged 21, wowed audiences and adjudicators with her performances of “So Big / So Small”, “Pulled” from The Addams Family and “Being Alive” on the stage of the Royal International Pavilion in the competition’s final. As winner of the coveted title she will receive an international Medal, £1,500 prize money and the opportunity to perform at the Gold Coast Eisteddfod in Australia in October 2018. The all-expenses paid trip is funded by the Gold Coast Eisteddfod. Mared fought off tough competition in the preliminary rounds of the competition, which took place in Llangollen Methodist Church on Tuesday, landing a place in the final alongside Kade Bailey from Canada and Megan-Hollie Roberson from Wales. Adjudicators Kate Edgar and Sarah Wigley placed Kade in second for his rendition of “She Loves Me”, while Megan-Hollie came third, with her wonderful performance. Mared said: “Having been placed third last year, it’s really exciting to see my progression into first place this year, and I’m really proud to be able to represent Wales at the Eisteddfod”. The Gold Coast Eisteddfod features over 70,000 singers and dancers, 330 bands and orchestras, 175 choirs, almost 1,500 dance groups and over 3,000 solo dancers. Music Director of the Llangollen International Musical Eisteddfod, Vicky Yannoula, added: “Mared gave a stunning performance for the audience and adjudicators during this year’s competition and we would like to congratulate her on being named the International Voice of Musical Theatre 2018.
large and appreciative audiences throughout the day. * On an outside stage at the field, two members of North Wales Opera Studio give a gripping performance. * The Cathays Brass band from Cardiff, who has earlier been competing on the main stage, come outside to entertain with a Latin rhythm. Earlier in the week this year’s Peace Message, written by Christine Dukes for the third consecutive year, marked the centenary of the end of World War One and told the tale of sightings of the ‘Angels of Mons’ who were reputed to have appeared to both Allied and German forces in their time of need in 1914. 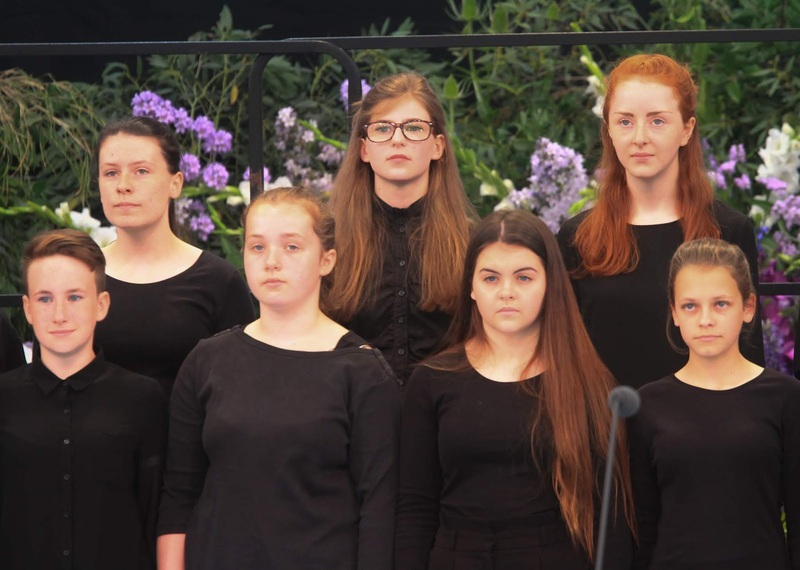 Concluding with a peace song called Peace at Last, written by Christine and composed by Elen Mair Roberts, Chair of the Music and Staging Committee of the Eisteddfod, the performance remains a poignant reminder of the message at the heart of the festival. * Tomorrow (Friday) sees the traditional and highly colourful Eisteddfod parade, from the field to the town centre, starting at 4.30pm. * Students from Ysgol Dinas Bran who delivered the Peace Message.